If you have been accessing mails through your Gmail account you probably noticed that your inbox has been divided into different sections. Well, this has not been done so much for convenience but for marketing purposes. In fact, Gmail has slightly tweaked its advertising model and offering them in a novel way i.e. in your inbox and taking it a step further. Take a detailed look at your mail box and see the change where ads have been placed under a special tab ‘Promotions’ which differs from your earlier mail page where the ads were displayed above the mailbox and looked similar to those displayed on the Google’s Search Page. Pay more attention to the mails in the Promotion tab which are of course, promotional but at the same time they can be used like any other email and forward to others too. Google has thus opened up an entirely new vista of marketing avenues through its user’s mail boxes in order to expand the marketer’s outreach. Email marketing is after all directed to reaching out to users through their inboxes. Some marketers will be glad to use this as it implies goodbye to manual coding of emails where there were greater instances of orphaned codes or misplaced codes being created. Instead, Google assures marketers that their promotional email will be delivered right into the desired mail box. Also, this means accurate work accomplished in minimum time and reduced effort. This is despite the fact that the unsubscribe feature has yet to be checked out for the ad mails, asthey’re simply sent across. Meanwhile, the marketers who can take advantage of these services are filtered on basis of certain criteria meaning they are rated well amongst the users/customers. If this Google’s marketing initiative clicks, marketers have a chance to rejoice for online marketing is going to change dramatically. It is certainly definite that this trend of ads in the mail box is revolutionary and likely to throw up new vistas for online marketing especially beyond the limits of Google Adwords and Banner ad campaigns which depended on search. Till then, it’s wait and watch time to grasp and understand the entire initiative of Gmail Ads while thinking of novel ways to engage consumers and their target audiences through this channel. 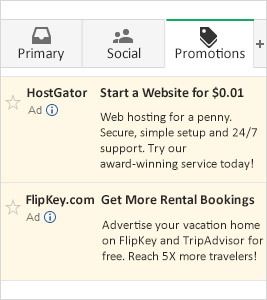 This ‘ads email’ innovation is indeed revolutionary and coupled with new Gmail layout; it’s non-intrusive giving you a clean opportunity to target your user. Inbox is one place where the user gives you his undivided attention and with in-depth customization of the ads offered by Google the chances of conversion definitely increase. We see it becoming a big part of the ads mix as soon as it’s rolled out for everyone. What’s Up With The Panda Update 2.2 and the latest one 3.9?